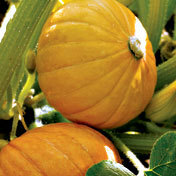 description for "Winter Squash and Pumpkins: Cucurbita maxima, 'Gold Nugget'"
Cucurbita maxima 'Gold Nugget' is ideal for small gardens. This buttercup shaped squash has hard red-orange skin and sweet, fine-grained, dry, dark yellow/orange flesh. 'Gold Nugget' was an All America Selections winner in 1966. Extremely productive and a good keeper. Sow 2-3 seeds every 3-4 feet in rows 3-6 feet apart when danger of frost has passed. Thin to one plant. Can be sown indoors, 2-4 weeks before the last frost, and transplanted very carefully. Enrich soil heavily with mature compost. Pick before frost when stem cracks and skin hardens. Planting depth: 1 inch. Days to germination: 7-10 days. 75-95 days to maturity. reviews for "Winter Squash and Pumpkins: Cucurbita maxima, 'Gold Nugget'"